If you’re a regular Clicks shopper, you may have noticed a new haircare line is available in their aisles. I was very excited to hear that Clicks was launching their own line of hair products for Black hair. 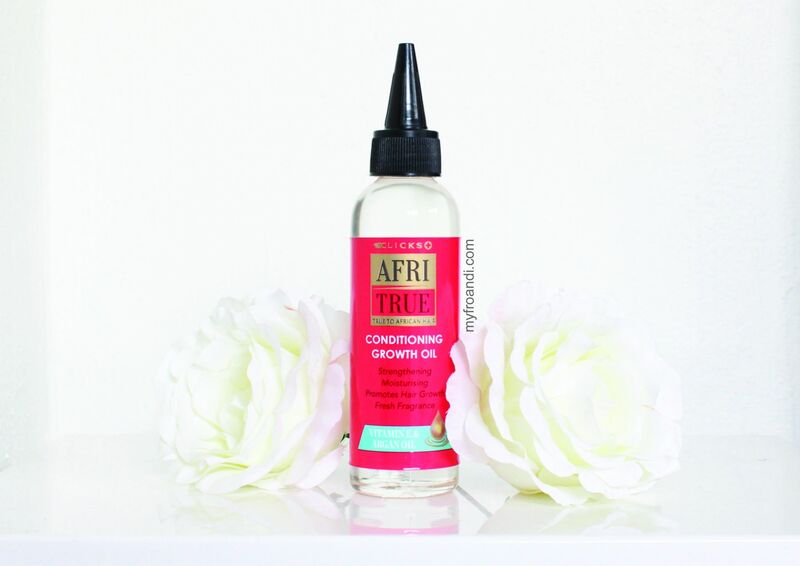 Exclusively at Clicks, the Afri True range promises to be a powerful blend of deeply moisturising Argan, Coconut, Olive and Jojoba oils that has been specifically formulated for African hair for greater growth, resilience, moisture and shine. It has more than 10 different products in the range to cover women with different hair and style choices. As I currently have a protective style installed, I’ve used some products from this range on my crochet braids for the past couple of weeks. This lotion promises to moisturise the scalp, as well as deep condition dry, damaged hair. It also protects hair from daily chemical processes and styling tools. My two cents: I didn’t use this on my own hair but rather on my twists, focusing on the ends to help them stay looking fresh. It helped to keep them looking moisturised rather than straw-like dry which I find a lot of synthetic fibres end up looking like. I found the scent was okay, not too overpowering but not scrumptious either (you know how picky I am when it comes to product scents). The consistency was normal for a lotion and was absorbed nicely without leaving a gunky feeling. Hair Keratin, Hyaluronic Acid, Linoleic Acid, Linolenic Acid, Triticum Vulgare (Wheat) Germ Oil, Sorbitol, Tocopherol, Methylparaben, Propylparaben, Disodium EDTA. My two cents: I haven’t been using this long enough to be able to comment on the hair growth promise. It’s a thicker kind of oil, so you don’t need too much to apply a good amount on your hair especially your hair line if that’s your main area of concern. It applies nicely with the nozzle top which makes it easier to reach those tight areas if you have a protective style braided or weaved in, like me. I’m disappointed that mineral oil (paraffinum liquidum) is the most predominant ingredient in the formula and would have liked to see the coconut, jojoba and argan oils higher up in the list as they’re known to be great for a healthy scalp and hair. Ingredients: Paraffinum Liquidum, Isopropyl Palmitate, Cocos Nucifera (Coconut) Oil, Cyclomethicone, Simmondsia Chinensis (Jojoba) Seed Oil, Fragrance, Tocopheryl Acetate, Argania Spinosa (Argan) Kernel Oil, Retinyl Acetate, Menthol. This spray contains Jojoba and Argan Oil to nourish hair, moisturise scalp and give intense shine, body and volume to hair. My two cents: This worked well on my twists to give them shine. I used this every other day or so to help reduce the look of dullness. The scent was also ok and it didn’t linger on my hair for too long afterwards. And like the oil, a small spritz goes a long way. I would’ve liked to get a spray that helped with itchiness although I think they do have one available (Softening Multi Spray). Ingredients: Butane, Propane, Paraffinum Liquidum, Petrolatum, Argania Spinosa (Argan) Kernel Oil, Simmondsia Chinensis (Jojoba) Seed Oil, Methylparaben, Propylparaben, Diazolidinyl Urea, Fragrance. (eg. Parabens). That’s me, and I know I’m a bit more particular with my product use and ingredient search than the average woman. I think the price point for each of these products is great. It’s affordable, and the fact that it’s made by Clicks makes it easily accessible to women across the country. You can find Afri True products at your nearest Clicks store. 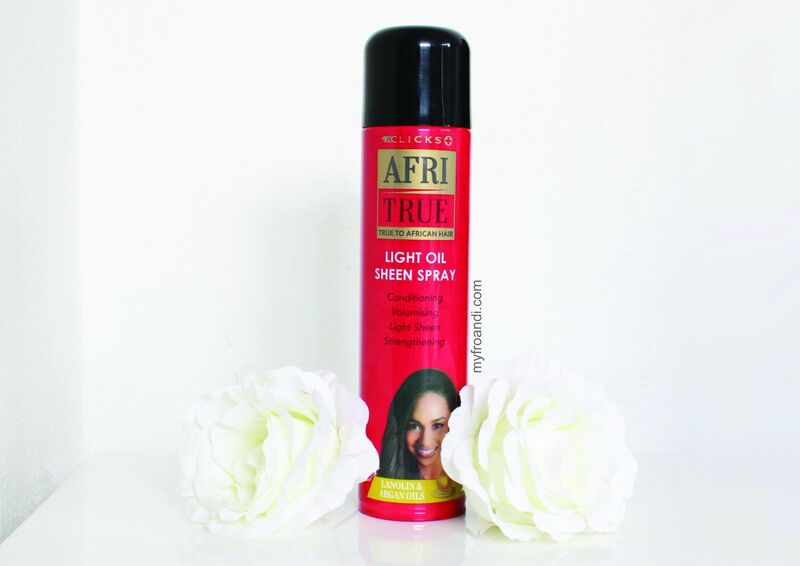 *This post was sponsored by Afri True. 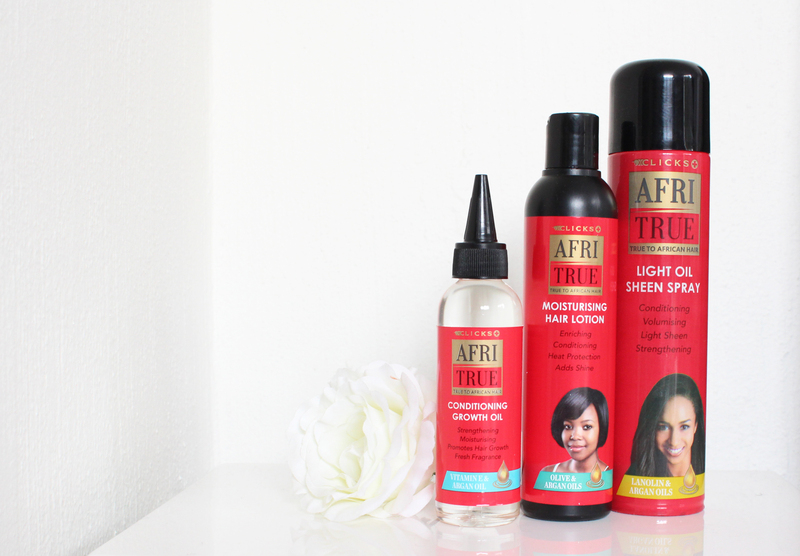 i think i must try these products,its been almost 2years of going natural and my hair remains the same lenght regardless of what i do. Hi Aisha. Very honest review. Thanks. I was completely unimpressed with their line because the ingredient list as well. Mineral oils and parabens are a complete no no for my natural hair. The hair food sounds interesting. would come in very handy for the winter but Unfortunately these fees haven't fallen so the budget is pretty tight. I used the hair-food. It's super amazing on my weak hair as I have noticed my hair is stronger. It also has a tingling effect; especially used on a just-washed scalp, almost a massage…a little heaven!!!*hides*. I will use the oil once I have cornrows on. I'll also try the other products, depending on what I have done on my hair at the time…It's official – I love this brand! I also did not try it because i read the ingredients and mineral oil disapointed me.